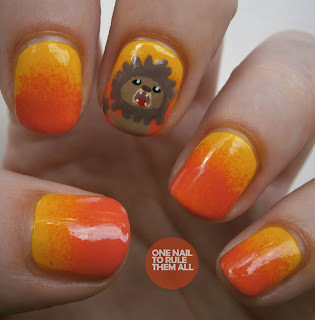 When I was thinking through this challenge there were never any dispute over which band's song I'd be basing my nails around. It was always going to be Mumford and Sons. 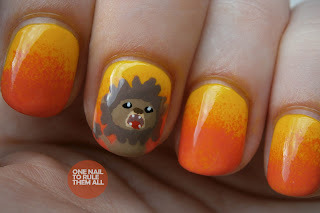 Unfortunately their songs aren't very transferable to nail designs, so I picked the most obvious and went with 'Little Lion Man'. If you've never heard of them, open a new tab/window now (don't quit this post because what would be the point in me writing it eh? And you wouldn't get to see the nails) and go to youtube. I'd recommend Dust Bowl Dance or Thistle and Weeds, but they're one of those bands that makes a brilliant song absolutely every time, so just type in their name and go with the flow if you must. I'm ranting on about them now I know, but they are brilliant musicians. I went to see them live at the beginning of June when they came to Huddersfield (whut?) and they were just as good, if not better, and that says something about a band. ANYWAY, here are the nails, which I'm sure is what you came here to see. I used Barry M - Yellow and sponged on Revlon - Mad About Mango. Then I painted the lion just by mixing Barry M - Mushroom with Barry M white/black for the lighter and darker shades of brown using a very small brush and then used acrylic paint for the details. Hope you like them! that lion is soo cute! Hii!! This lion is sooo cute!